Let Go of What’s Holding You Back! Reclaim control of your time, energy, and money from your suffocating clutter. Includes eBay, craigslist, & Amazon Modules, 10 Video Interviews & 30-Day Email Support! Earn More Money in Less Time. Learn *what* to sell and *where* to sell it!… Save hours of time and pocket more cash. What If This Were YOUR Success Story? So my running total of $$ made from selling crap, as of today = $1,665. Of course, that doesn’t include anything currently listed on Craigslist, eBay or Amazon, or on the racks of the consignment shop. It also doesn’t include all the crap I’ve donated. I am seriously loving hating debt. I still have a long way to go. A long way. And I realize that some of my friends look at me like I’m some sort of insane convert when we talk about “decluttering.” They mean: “getting rid of some of the junk that’s on the shelves in my living room,” and I mean: “use every possible method you can think of to unload your crap because it is standing in the way of a freer life.” But that’s okay. I love how this whole process is working for me. Determine what stuff in your life is worth keeping and what’s holding you back. Jump-start your purge – two powerful strategies to get started fast. Finally let go of sentimental items that keep you trapped in the past. Unite your family and rally your loved ones to attack clutter together. 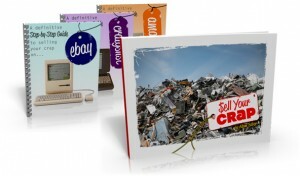 Learn which items sell well (and which flop) on eBay, craigslist, and Amazon. Get started – even if you’ve never used eBay before. Avoid common mistakes people make when researching value. 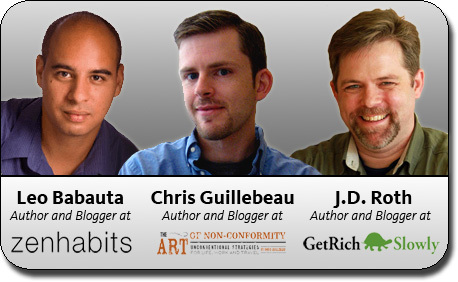 Create descriptions that sell with a proven 10-step formula. Navigate the listing form – we cover every inch of the form line-by-line. Gain the confidence to troubleshoot rare problems during and/or after the auction. Take the hassle out of shipping – discover the best way to pack and ship your items. 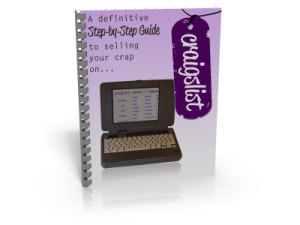 The Definitive Step-by-Step Guide to Selling Your Crap on craigslist – a 7,500+ word, 49-page manual for hacking and mastering the mechanics of the world’s largest digital classifieds. Case Study: How Courtney made $650 in 2 hours off an item I thought was worth $50! How to communicate with buyers – eliminate the hassle and save time. 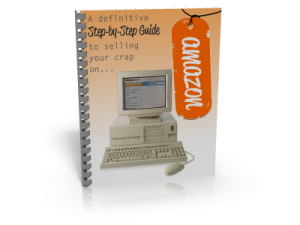 The Definitive Step-by-Step Guide to Selling Your Crap on Amazon – a 5,000+ word, 41-page quick-hitter to leverage Amazon.com to maximize your profits on your media items. Get the highest possible price for your books, CDs, DVDs, and video games! Make money in your sleep – techniques to automate the Amazon selling process. These interviews alone are worth the price! Inspiring your spouse: Lead by example… slowly and patiently. Consumerism in the U.S. compared with Guam: How to stay on your toes. #1 item Chris never leaves homes without – despite traveling to 190 countries. Most commonly over-packed items when traveling. Perspective on consumerism after 4 years spent in Africa. “One Year Wardrobe Project”, J.D.’s creative approach to purging the clothes. Is rejecting consumerism harder when you can afford it more? Techniques for controlling “collectibles” – like J.D.’s comic book collection. 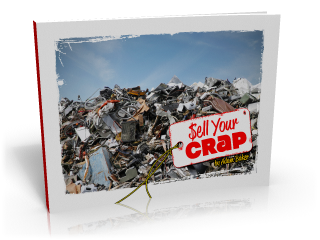 Sell Your Crap is amazing!… Adam and Courtney share their personal journey with humor and honesty. They share their “before” and “after” experiences, giving all of their specific suggestions the power of “why.” … The color screenshots blow any DUMMIES GUIDE out of the water. Step by step, screen by screen, this technophobe can conquer these venues. I no longer cower over Craigslist, evade eBay or avoid Amazon.com. I feel like I’ve stolen the other team’s playbook. I’ve felt more and more liberated over the past few years as I’ve become location independent and gotten rid of so much stuff. Baker has put together an excellent and compelling step-by-step plan for achieving your own liberation from stuff and for making some cash along the way. It’s indispensable for anyone who wants to live a better life with less. Baker shows in excruciating detail “how” you can launch your counterstrike on crap! He pulls from his own tried-and-true strategies and winning tactics… Baker put his entire soul into this program. The quality is freakin’ amazing! And when you’re done reading these guides you’ll swear you’ve been best mates with Baker since kidhood. 30-Day “Ask Anything” Email SupportAs a final bonus, we’re throwing in 30-Day “Ask Anything” email support. This is exactly what the name implies. For the first 30 days, when you are getting started putting Sell You Crap into action, you will have unlimited email access to our team to ask questions about purging your possessions. Can’t remember where a topic is located? Email us. Have a specific question about an item? Email us. Overwhelmed and want to know where to start? Email us. We’ll either show you where in the package of guides and modules you can find it or answer the question myself. 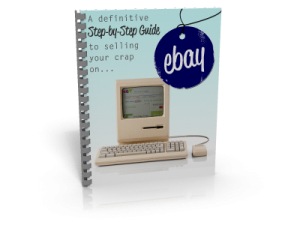 In essence, we’ll be your personal help desk for the next 30 days as you put the Sell Your Crap Guide into action! As always, our team thanks you for your continued support. Our lives have inhaled a new breath of freedom from ridding ourselves of crap! Now it’s your turn! Please don’t hesitate to contact us… we’d love to hear your stories of nuking clutter and selling your crap.